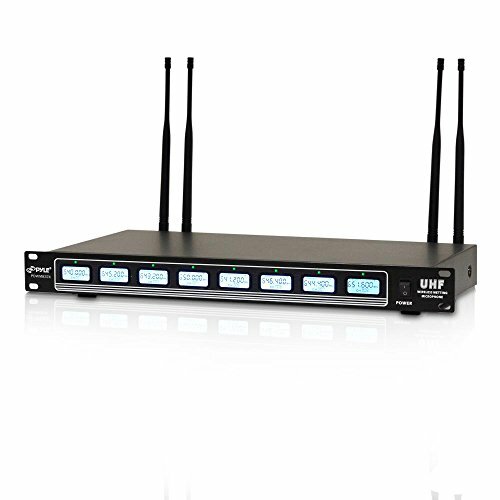 The Pyle 8-Channel Wireless Microphone Systems provide wide area signal range coverage with hassle-free operation. 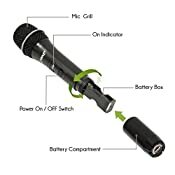 Wireless UHF audio transmission allows for distortion free and crisp vocal audio performance for all of your microphone needs. The system base receiver features a fixed frequency signal design, independent adjustable channel volume controls, digital LCD displays with frequency read-out, along with receiver rack mount compatibility. 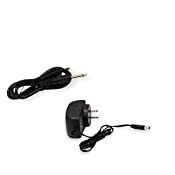 Additional system features include XLR balanced input and 1/4’’ mixed output jack for additional connectivity. 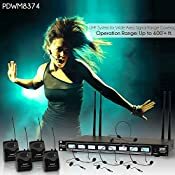 Enjoy easy-to-use and crisp audio performance with the Pyle 8-Channel Wireless Microphone Systems. ASSORTED MICS - 8 body-pack transmitters to clip comfortably on any garment for use with included headset/lapel microphones. This system allows you to sing, talk or vocalize, leaving hands free to play any instrument. 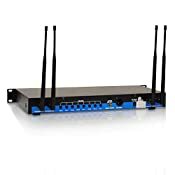 UHF - Wireless UHF band signal audio transmission provides unsurpassed performance with operation up to 600 FT for clear, noise & distortion free, crisp vocals & excellent sound reproduction. Great for conferences, broadcasting & social events. 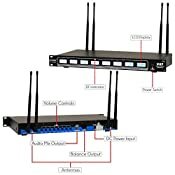 RACK MOUNT RECEIVER - Universal removable rack-mountable receiver base design with rotating removable quad antennas, independent channel volume controls, XLR balanced output, mixed 1/4'' unbalanced audio output & universal 110/240 Voltage. 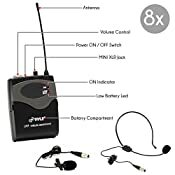 HIGH QUALITY- Wireless headsets & ultra-low profile lapel/lavalier MIC's designed for extended comfortable wear providing excellent audio quality with its omni-directional audio capture and projection of the subject.